West Bromwich Albion host Nottingham Forest this evening with one side in the play-offs, and the other having aspirations of gate-crashing the party before the season’s end. Darren Moore’s men saw off Stoke City last weekend to secure a win when not at their best to cement their place in the top-six, even more, heading into the final months of the campaign. Martin O’Neill’s reign as Forest boss has been indifferent with two wins and two draws under his belt as he looks to guide the club he once played for further up the table. Both sides are reliant on their main marksmen to deliver their aims for the season with the Baggies relying on Dwight Gayle, their main source of goals this year. Lewis Grabban, on the other hand, is the talisman in the final third for the Tricky Trees. Without either player, both sides would have significantly fewer goals, and subsequently fewer points than they have right now. That would mean lower positions in the table – but for now, they are both aiming for promotion to the Premier League with West Brom the more likely of the two sides. The teams meet this evening needing wins for their respective objectives, and it will be interesting to see how the highlighted strikers get on for their sides. 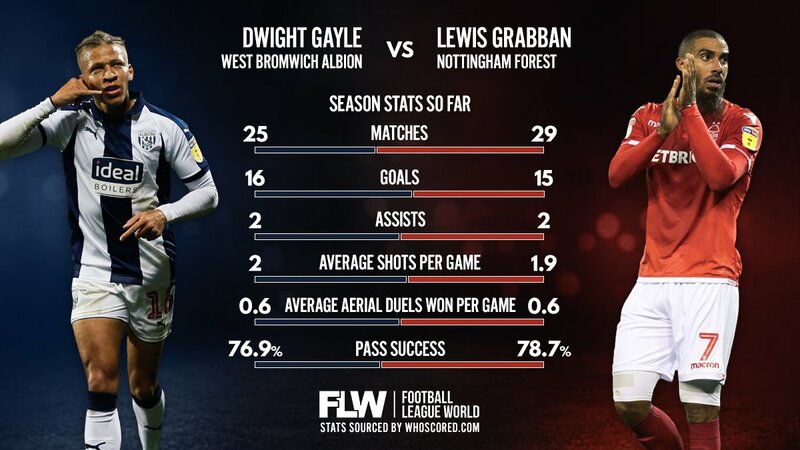 The season so far tells a pretty similar story between Gayle and Grabban. The Forest man has made more appearances and therefore played more minutes on the pitch, but it is his counterpart that leads the way in goals scored. Gayle eclipses his opposite number by one goal, having scored 16, with both dead level on assists with two each. West Brom’s Newcastle loanee is calmer on the pitch, too and shades the yellow card count by two, having picked up just one booking in his 25 appearances this season. There is just 0.1 in it when it comes to shots per game, on average for the two strikers, with Gayle, again, edging it here with two shots per game, compared to Grabban’s 1.9. With both creating similar chances on goal as the other, it’s the 31-year-old from the City Ground who offers more by way of passing on average per game. Grabban averages a 78.7 per cent rate of successful passes, 1.8 per cent better off than Gayle. Of the two, Gayle has scored more important goals. This past weekend, for a recent example – West Brom won 1-0, courtesy of Gayle, while Grabban scored the first in a 2-1 win. Yes, he got Forest off to a good start, but it was not a winning goal. The Baggies and Forest were where they find themselves because of the importance of the goals their man men score. And with the two so close statistically, it’s the Baggies man who edges it and could well be the difference between the two sides this evening.